It is our privilege to welcome you to an enchanting evening, which will surely mesmerize you and take your breath away. 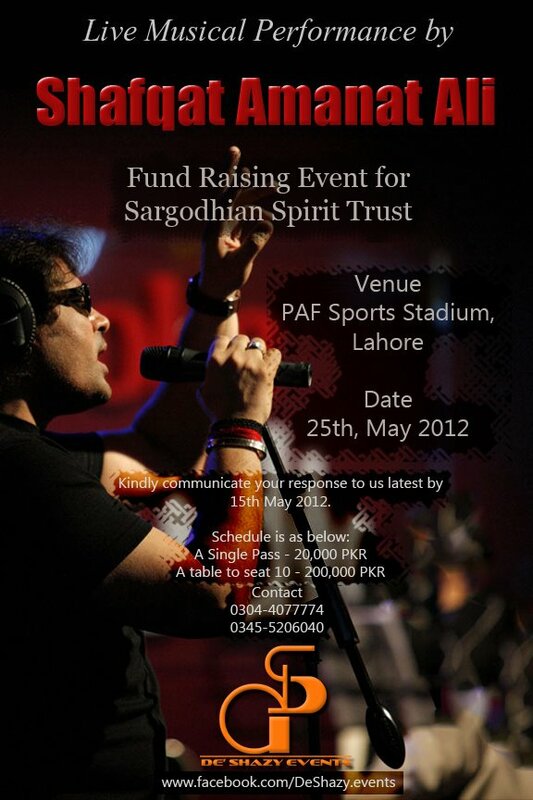 Join De' Shazy Events & Sargodhian Spirit Trust for a wonderful musical evening at PAF Sports Stadium Lahore on 25th, May 2012, where you will get a chance to enjoy a live musical performance by Shafqat Amanat Ali, the legendary vocalist, musician and performer from Pakistan who will put a spell on you with his melodious voice. To finance underprivileged students get first rate education, please book a table at this event.As space and security considerations dictate a restricted number of tables, we could be grateful if you could communicate your response to us latest by 15th May 2012.